Santa, I hope you like shortbread. I must admit, the jolly old man was going to get Oreos this year. But when Dillon asked to make homemade cookies for Santa (and Frosty?) my motherly guilt kicked in. We decided on sweet, buttery shortbread. 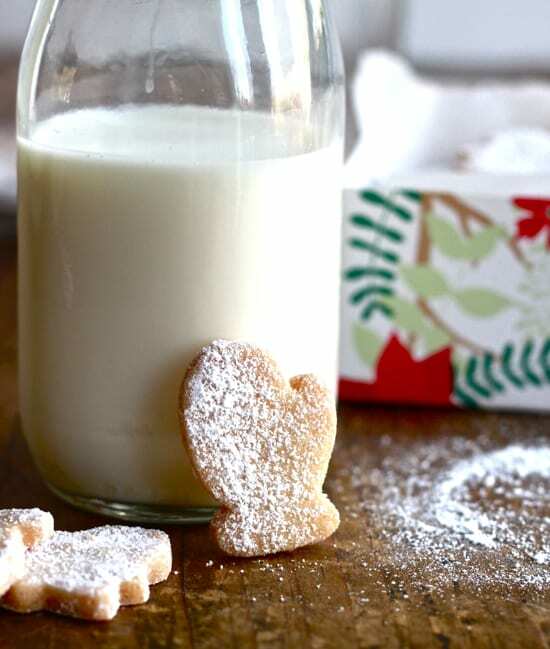 My recipe uses regular sugar instead of confectioners sugar, which is what you’ll find in most shortbread cookies. I also use self-rising flour to lighten the texture. 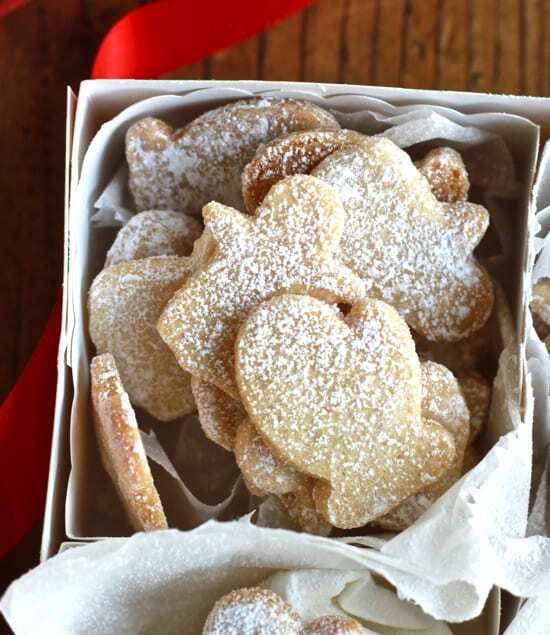 These ingredients yield a more tender and flaky cookie, similar to Walker’s Scottish shortbread. Whenever I make cookies that require rolling & cutting, I like to split the workload up into 2 days. Day 1- Make the dough. Chill for at least 30 minutes- overnight. Day 2- Roll & Cut. Roll the dough to about 1/4 ” thick. Do this between 2 sheets of floured parchment. Plastic wrap will work too. If at anytime the dough starts to soften (and it will), pop it back into the fridge to chill and then start again. 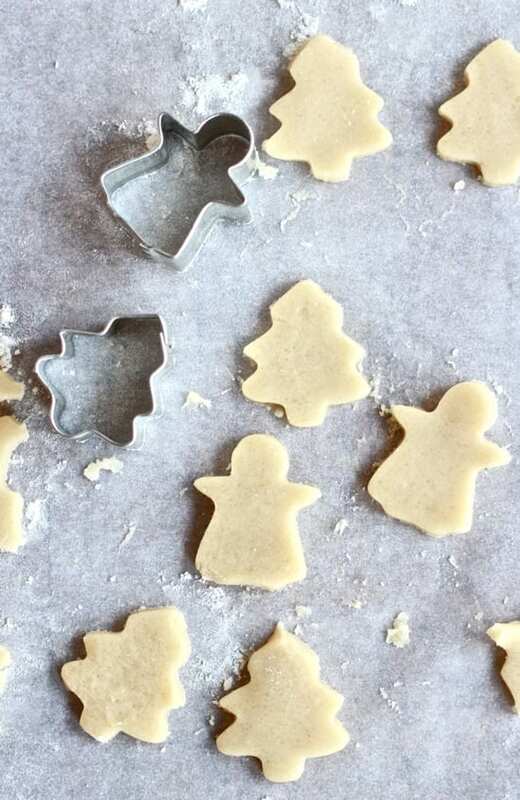 Prior to baking, freeze the shaped dough on a lined cookie sheet for about 5 minutes. This helps to keep its shape when it hits the hot oven. Bake at 325 F for about 20 minutes. They should be golden, but not too brown. Lightly dust with a sprinkling of powdered sugar. 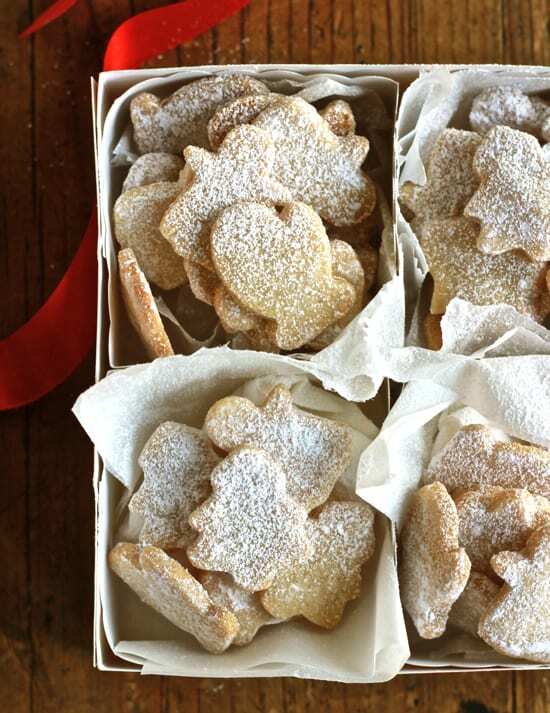 * Shortbread requires only a few ingredients; butter, flour & sugar. It’s best to seek out good quality products for maximum flavor. You will definitely taste the difference! * For best results, use store bought self-rising flour (not homemade). Commercial self-rising flour has a low protein content that yields a light and tender cookie. This flour is available in most grocery stores and can be ordered online from King Arthur Flour. 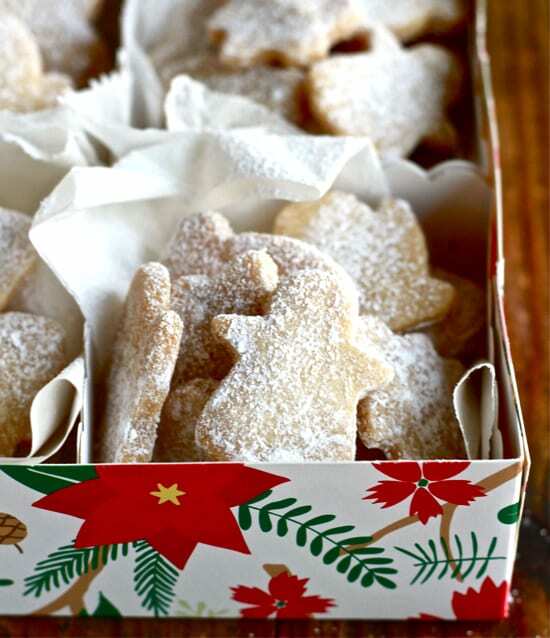 Preheat your oven to 325 F. Line 1 or 2 cookie trays with parchment paper. 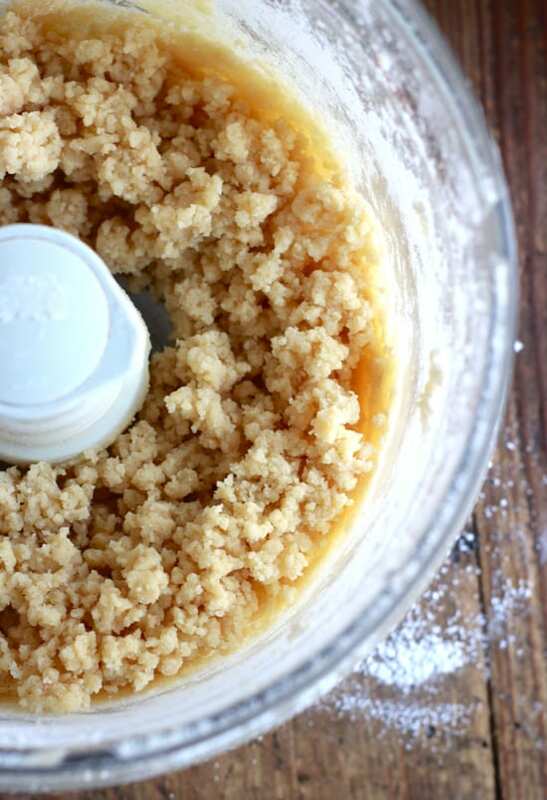 Place the butter, sugar and vanilla into a food processor fitted with a metal blade. Process until light and fluffy. You can also use a stand or hand held mixer for this. Sift the flour into the food processor. Run the machine until the dough comes together. It should be a little crumbly and soft, but not too sticky. Tip the dough out onto a work surface, and bring the dough together to form a ball. Flatten the dough into a disk and cover in plastic wrap. Chill for 30 minutes- overnight. Roll the dough to about ¼ inch thick. Do this between 2 pieces of floured parchment paper. Floured plastic wrap will work too. 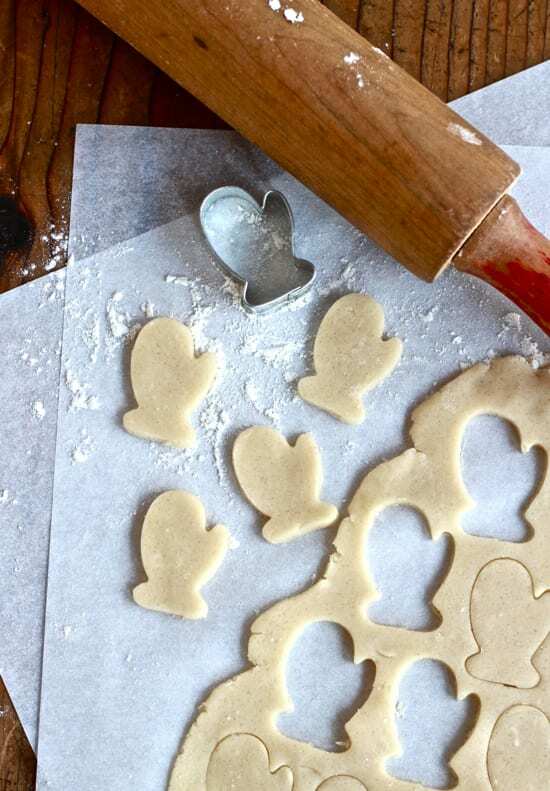 To keep them from sticking, dip the cookie cutters in flour and press into the dough. If the dough begins to soften, place it back into the fridge to chill, and then start again. 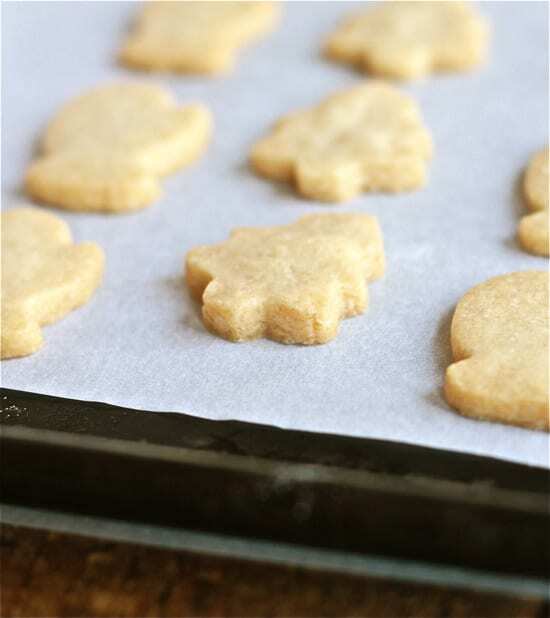 Using an offset spatula or butter knife, transfer the cookies onto a parchment lined cookie sheet. Place in the freezer for at least 5 minutes prior to baking. This will help to keep its shape before going into the oven. Bake for about 20 minutes (check at 15 minutes) or until lightly golden. Rotate the pans halfway through cooking to promote even browning. Remove from the oven and cool for 5 minutes on the tray. Transfer to a wire rack. When the cookies are completely cool, dust with powdered sugar. Cookies will keep in an airtight container for 1 week. Lucky Santa. They look deliciously festive. Lucky yes… but at the rate we’ve been eating these things, he might be getting a sandwich! Thanks Anne! Awww thanks Katy!!! Your Christmas cookies are still the best. You’re the only one who can make those darn gingerbreads!!! 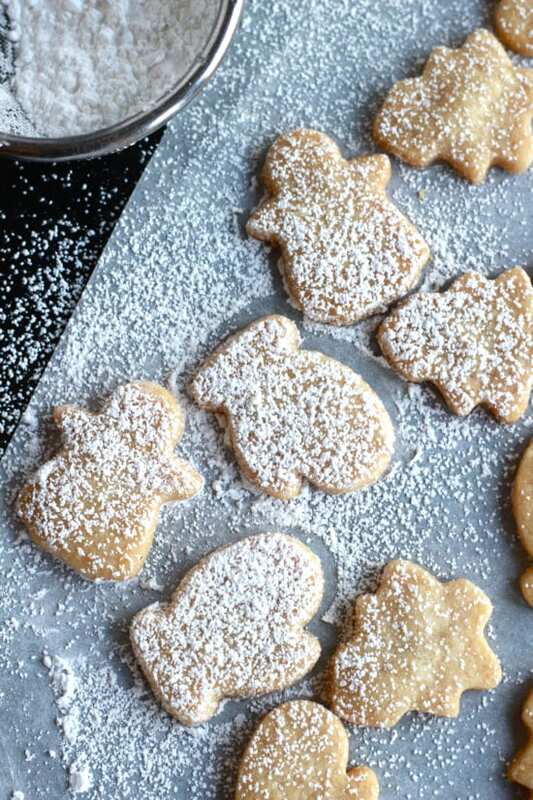 Just curious, these sound so good and a little better than the normal “sugar cookie” for our “kids cookie night” Would these or have you ever iced decorated them instead of the powdered sugar? Alright, you got me. I’m going to have to make these. Do you think using salted butter would ruin them? Hi Meghan! I love baking with salted butter by the way ;) You can go ahead and use salted butter for this cookie recipe, but you absolutely have to replace the self rising flour with all purpose flour + 1/2 tsp baking powder. Self rising flour has salt in it, so it will be too salty otherwise. I speak from experience… Happy Baking! Thanks for the tip; it worked out great! Emilie, I am a new follower. This recipe looks delicious. There are so many ways to measure flour. Could you tell me how many ounces you use per cup? You have an estimable recipe for duplication and tinkering. I am a pastry chef, these ingredients are easy to come by and often snobby chefs look sideways at using self rising or regular sugar. As a pastry chef who has been amongst some of the haute cuisine snobbish elite high earning food industry fanatics I find that when you have no pretensions about how to create food you find beauty and grace and serendipity that transcends banality or stodgy ideas and you end up with a wonderful food and memory attached. This recipe I “borrowed” for today I’m attributing to you in my treasury of personal recipes for my children. The cookies we are baking are feeding friends and strangers at a gathering to create Christmas for a family who needs a “Santa”. Thank you for your energy and time that made my mise en place speedier and less difficult! Hi Mary! If the dough is not sticking together, there might not be enough moisture in the mixture. This could be due to weather, brand of self-rising flour etc. Even if you used all purpose flour, the dough might be more dry. Try adding a tiny bit of water while processing (just 1 tsp at a time). But don’t overdo it! The dough should be crumbly but stick together when you pinch a chunk between your fingers. These look great! Just one question. Does the butter have to be at room temperature or cold. My husband has been wanting shortbread so I figured I’d give these a try.